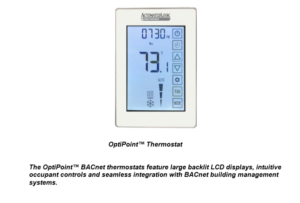 Automated Logic Corporation is proud to introduce its new OptiPoint BACnet thermostats. These thermostats offer control of a building’s heating, ventilating and air conditioning system from inside a facility, or from any BACnet-compliant building management system (BMS), including ALC’s powerful WebCTRL building automation system. Automated Logic, a leading provider of innovative building-management solutions, is a part of Carrier, a leading global provider of innovative HVAC, refrigeration, fire, security and building automation technologies. The OptiPoint BACnet thermostats can operate stand-alone or on a BACnet MS/TP network. Setpoints and occupancy status can be controlled directly through the thermostat or any BACnet BMS, making it easy to view, schedule, and manage the connected HVAC systems from within the building or remotely at any time of day. Seamless integration with ALC’s WebCTRL building automation system provides operators with additional visualization tools like graphics, trends, dashboards and alarms, as well as anywhere/anytime access from web-enabled devices. The thermostat buttons and touchscreens can also be locked down to limit occupant interaction and setpoint adjustments when the BMS is in control. Flexible, 7-day scheduling via the thermostat. Setpoint and occupancy overrides via the BACnet BMS. 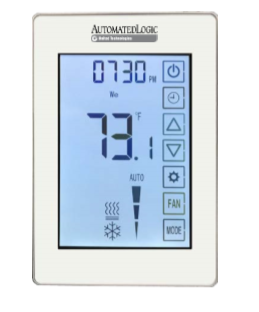 Large, easy-to-read temperature displays on the thermostat that include setpoint adjustment, fan speed control, and heating/cooling mode control, Humidity control. programmed to pinpoint economizer faults. On-board I/O for connecting remote temperature sensors, door/window switches. CO2 sensors, and other devices to invoke additional energy-saving control strategies. The new OptiPoint BACnet thermostats are available for order on Feb. 1, with release scheduled for mid-February.